🎲 Happy Tuesday from Vegas on opening day of the Consumer Electronics Show. White House officials are increasingly concerned that the impending real-world effects of the shutdown could swamp Republicans if they don't find a way to make a deal fast, Jonathan Swan reports. Trump's prime-time address at 9:00 ET tonight, his first from the Oval Office, is part of an urgent P.R. strategy designed to make up for what some Republican officials feel was a languid use of the president's bully pulpit over the holidays. Trump aides realize the situation could slip away from them politically as the impact is felt by taxpayers and federal workers across America. So the urgency is in putting pressure on Dems, and trying to make them own a "crisis" at the border. "I have no idea how this ends. I really don’t," a senior White House official said. According to conversations with multiple sources familiar with speech prep, the White House plan is for Trump to ditch his fiery campaign rhetoric and hot partisan attacks on Speaker Pelosi and Senate Democratic Leader Chuck Schumer. But nobody will say so on the record. One reason: It’s Trump. And there’s never quite a 0% chance that he scrunches up Stephen Miller’s script, ignores the advice, and does what he does. Inside the strategy: West Wing officials plan to spend the next 72 hours hammering Democrats and trying to make them feel pain for the shutdown. You’ll hear the word "crisis" a lot, and the assertion that Democrats refuse to negotiate. Vice President Pence has repeatedly mentioned a front-page Washington Post story that referred to "a bona fide emergency on the border." A group of reporters, during a briefing in the Eisenhower Executive Office Building, was given a slide deck with statistics about border crossings. The point of the briefing — by Pence, Jared Kushner, Homeland Security Secretary Kirstjen Nielsen, OMB's Russ Vought and others — was to document a crisis. Fact check: "U.S. Customs and Border Protection encountered only six immigrants on the U.S.-Mexico border in the first half of fiscal year 2018 whose names were on a federal government list of known or suspected terrorists," according to CBP data obtained by NBC News' Julia Ainsley. But news coverage from the border makes it clear that agents are overwhelmed: A separate WashPost article last month said arrests along the border were exceeding 2,000 a day, and that smugglers were depositing "hundreds of rural Guatemalan families [in] remote areas of the U.S. border." these people is a big issue. Behind the scenes: Trump aides have deliberately held back on an Oval Office address — one of a president's most potent weapons. There was some internal discussion about doing one to sell tax reform, but it never got very far. So the fact that officials turned to the Oval now shows how much political weight they want to throw behind this. An important point to remember: Ordinary people, and in some cases vulnerable people, may soon be harmed by this shutdown. Food stamps and federal housing, among other things, are about to be hit. The White House Office of Management and Budget is scrambling to find ways to avoid these scenarios. But it's unclear whether enough money and enough legal latitude can be found. Another factor that the Trump administration is getting worried about: the damage for POTUS if House Republicans start to lose members on individual bills related to the shutdown this week, which is likely to happen. "Several dozen House Republicans might cross the aisle this week to vote for Democratic bills to reopen shuttered parts of the federal government," Politico's John Bresnahan and Sarah Ferris report. And the WashPost's Dave Weigel tweets: "Dems gained forty House seats in an election that Trump was trying to turn into a border referendum, sending troops and everything. The new Dems have zero fear about how the 'border crisis' plays." Be smart, from a well-wired Republican: “Interestingly, Ds are doing exactly what Rs did during the Obamacare shutdown — trying to open popular pieces one at a time." "I do not understand the Trump strategy: Why not let them open everything but Homeland? Don’t they want this fight to be about the wall and not parks?" The shutdown "could wreak havoc on U.S. agriculture, and the rural economy, as farmers wait on subsidy payments, loans and data they need now to make plans for the spring," per the Milwaukee Journal Sentinel's Rick Barrett. Bloomberg: "Farm income has dropped in five out of the last six years. And this season, growers have been hamstrung in selling their crops by an ongoing trade war with China." The shutdown is starting to affect air travel, with long weekend lines at some airport checkpoints, apparently caused by a rising number of security officers calling in sick while they are not getting paid, per AP. "Safety inspectors aren't even on the job." An FAA spokesman said that inspectors "are being called back to work on a case-by-case basis, with a priority put on inspecting airline fleets." 🚨 The Air Line Pilots Association International, with 61,000 members, wrote a letter to Trump saying the shutdown "is adversely affecting the safety, security and efficiency of our national airspace system." P.S. 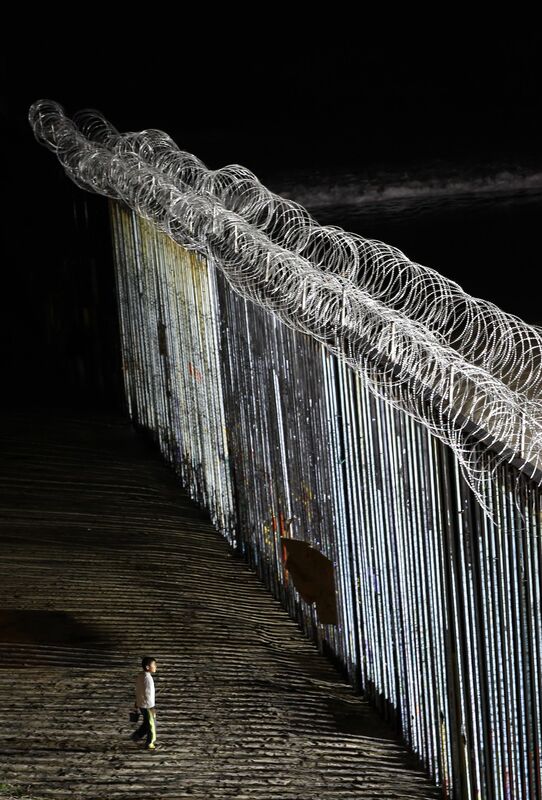 ... Trump is edging toward a national emergency declaration, and increasingly views it "as a viable, if risky, way" for him to build his wall, per the WashPost. In a study provided first to Axios, 68% of young people (ages 14 to 29) said school shootings are the most important issue facing the U.S., Steve LeVine reports. 77% said they or someone close to them had suffered from mental health issues. SocialSphere, which conducted the poll, linked that to the shootings. "The issue connects young Americans unlike anything except 9/11 in the last 20 years," said John Della Volpe, founder and CEO of SocialSphere, and director of polling at the Harvard Kennedy School's Institute of Politics. About the study: Della Volpe conducted focus groups of 14- to 29-year-olds in multiple cities — Atlanta, Chicago, Columbus, L.A. and Parkland, Fla. Then he polled 2,235 people from the same age group. School shootings were the No. 1 issue for female, white, black, Hispanic, rural and suburban youth. It was in the top three for male, Republican and rural youth. Almost 50% of African Americans said they know someone who has been shot. Important fact: School shootings have politicized this generation. A preliminary estimate is that 31% of those polled voted in the midterms, Della Volpe said, nearly double the 2014 midterm turnout for this age group. Shutdowns are "usually about something. In '95 and '96, it was balancing the budget. In 2013, it was about Obamacare and sequestration and cutting spending. ... This is like the 'Seinfeld' shutdown." — Joe Scarborough on MSNBC's "Morning Joe"
The surprise resignation of World Bank President Jim Yong Kim puts the Trump administration in a tough position, Axios chief financial correspondent Felix Salmon writes. The administration could nominate an internationally acceptable globalist to the job, the most powerful position in international development. Or the U.S. could face rejection as the world selects a non-American to head the bank for the first time in history. Less than a year ago, Kim said he was "completely committed to my job," after reportedly being approached to be president of Harvard. No one is saying why Kim quit so suddenly. But the vacuum caused by his departure is likely to create an international diplomatic whirlpool which could prove very tough for Trump to navigate. The president of the World Bank is elected by all the bank's member states in what the organization calls an "open, merit-based and transparent" process. So far, American men have always prevailed in that process, in accordance with a longtime gentlemen's agreement under which the head of the IMF is always European and the head of the World Bank is always American. With Trump in the White House, the Europeans have never been less inclined to scratch the Americans' back. If Trump were to nominate a well-qualified candidate like former PepsiCo CEO Indra Nooyi, Europeans would probably go along with the nomination, because cooperative game theory has worked well for them to date. On the other hand, there's no way Europeans would vote for a unilateralist Bannonite. The ball is now in Treasury Secretary Steven Mnuchin's court. NBCUniversal will reduce the number of ads during prime time, and is looking now at other times throughout the day to do the same, Axios' Sara Fischer scoops. NBCU, like other legacy TV networks, is trying to push away from the old advertising model that networks relied on for decades. Today's consumers hate ads and new advertisers want more digital solutions. What's new: NBCUniversal tells Sara that it will reduce the number of commercial breaks in prime-time TV shows by more than 20% across all of its networks by 2020. Last year, it committed to a 10% reduction in ad breaks. The company also says it's looking to decrease ad breaks during additional shows outside prime-time slots, like 'Today" or "The Ellen DeGeneres Show." A spokesperson for NBCU says the company will expand its new lucrative ad format, Prime Pods. Those help reduce overall commercial time by letting advertisers reserve ad space for a higher cost during the very beginning or the very end of a show where a viewer is more likely to be hooked. NBCU will scale its new proprietary AI powered ad-targeting solution that reads scripts and closed captioning, helping advertisers connect its content at the scene level. Amazon is quietly piloting a program to let brands like Maybelline and Folgers pay to send free samples to consumers — all based on what the retail giant already knows they're likely to buy, Axios' David McCabe and Sara Fischer report. Why it matters: Turning free samples into new targeted ads plays to Amazon's strength as a trusted delivery service of everyday goods. Amazon is betting the sample strategy is something its biggest competitors — Google and Facebook — can't match. Amazon tells consumers that it "surprises select customers with samples that we think will be delightful and helpful." "The warnings sound like the plot of a Hollywood spy thriller: The Chinese hide malware in a Metro rail car's security camera system that allows surveillance of Pentagon or White House officials as they ride the Blue Line — sending images back to Beijing," the WashPost's Bob McCartney and Faiz Siddiqui write. "Or sensors on the train secretly record the officials’ conversations." "Or ... software ... allows ... foreign agents or terrorists to cause a crash." "Congress, the Pentagon and industry experts have taken the warnings seriously, and now Metro will do the same." "The transit agency recently decided to add cybersecurity safeguards to specifications for a contract it will award later this year for its next-generation rail cars." 👀 "China’s state-owned rail car manufacturer could win the deal by undercutting other bidders." President Trump is curious — and White House aides, alumni and reporters are anxious — ahead of the Jan. 29 publication of the tightly embargoed "Team of Vipers," a delicious, unsparing memoir by former Trump aide Cliff Sims. The book is based on hundreds of pages of contemporaneous notes by the young Alabaman, who has a rare eye and ear for cinematic detail. The Daily Beast reports: "A 2016 campaign veteran, Sims had enjoyed wide access in part due to his personal friendship with Trump. The two men were so close that the president affectionately called him 'my Cliff.'" "[T]he president began asking associates in November if 'we lost Cliff?'" Scoop: ABC News has won a fiercely competitive effort to score the first broadcast interview with Sims, whose book deal was seven figures. The author will sit down on "Good Morning America" with George Stephanopoulos, whose White House memoir, "All Too Human," was an inspiration for Sims. Sims will also appear on "The View" and "Nightline," as well as other ABC platforms. Sims has a massive media lineup for rollout week, including all cable networks and Stephen Colbert. According to a publishing source who has read the book: "No one emerges unscathed." 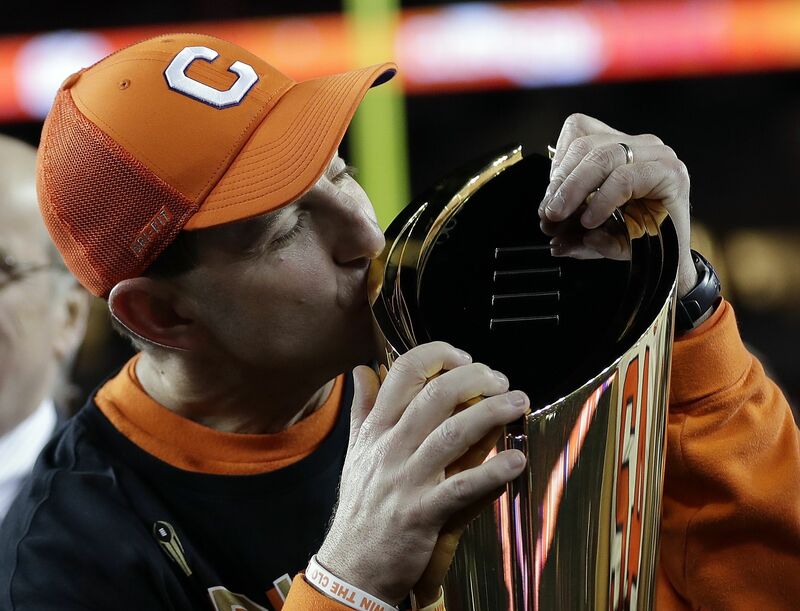 "Clemson certainly joins the conversation with teams such as Knute Rockne’s Notre Dame powerhouses of the 1920s, the dominant Army teams of the 1940s and Bud Wilkinson’s Oklahoma dynasty of the 1950s." "More recently, the 1995 Nebraska Cornhuskers, 1999 Florida State Seminoles, 2001 Miami Hurricanes and 2004 Southern Cal Trojans were unbeaten national champions considered among the best teams ever." "But the [15-0] Tigers are the first team to win every game in the playoff era, which began during the 2014 season." Final AP poll: 1) Clemson ... 2) Alabama ... 3) Ohio State ... 4) Oklahoma ... 5) Notre Dame ... 6) LSU ... Tie for 7) Florida, Georgia ... 9) Texas ... 10) Washington State.